Thirty Four: Pacific Dawn — The Old Town Alchemy Co. I had things to do last week. Oh yes, it was exciting, not least because one of them was the Edinburgh regional final for the 42 BelowCocktail World Cup. 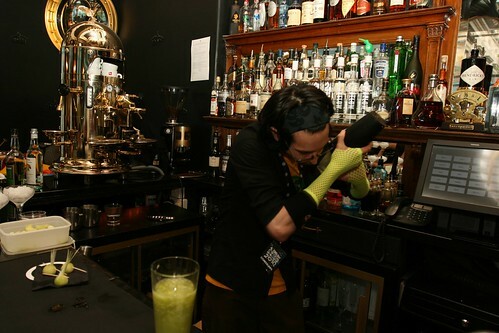 There were two parts to the competition - the signature drink round worth 70% of the final mark and the honest drink round which made up the remaining 30%. 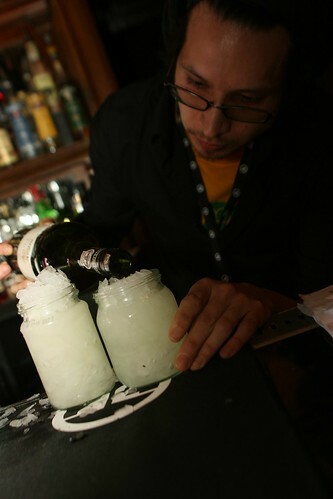 The idea behind the honest drink round was to come up with a recipe including a 42 Below variant and no more than four other ingredients from a set list of ingredients. The list was pretty comprehensive, but it meant that there were no homemade infusions or anything too crazy. Having presented A walk in the clouds as my signature drink - the only cocktail named after a Keanu Reeves movie on the day - I went for a twist on a Greenwich Sour using 42 Below Manuka Honey. Shake the first four ingredients with ice and strain into a rocks/old-fashioned glass over crushed ice. Float the port and garnish with a twist of lemon zest. The top three in the competition go on to form Team Edinburgh in the UK final in February. Unfortunately I didn't make it - congratulations to Joey from Tigerlily, Mei from the Bon Vivant and Paul from Bramble - which does mean I get to try out next year. Thanks to Jacob and Marty at 42 Below, and everyone at The Voodoo Rooms for a great day. Photos from 42Below UK's flickr photostream. Posted on August 24, 2009 by Jon and filed under Fiftytwo, Mixology, Projects, Recipes and tagged 42 Below Cocktail World Cup cocktails Cointreau competitions port the Voodoo Rooms vodka.